The first term has ended. Exams are over. 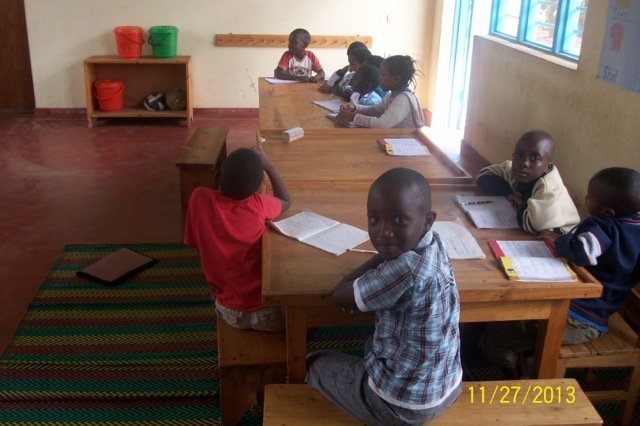 Children are waiting for their report cards. 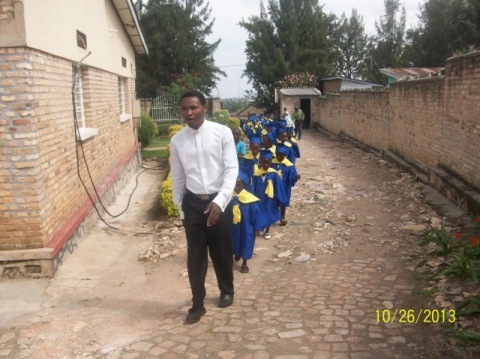 It is an exciting time as a two-week holiday begins and secondary school brothers and sisters come home. Please keep Urukundo and all our kids in prayer. We continue to pray for you. A SMALL START BUT A BEGINNING. There is room for 4 computers and a teacher. Still looking for good used computers. Willing and ready to expand this program. 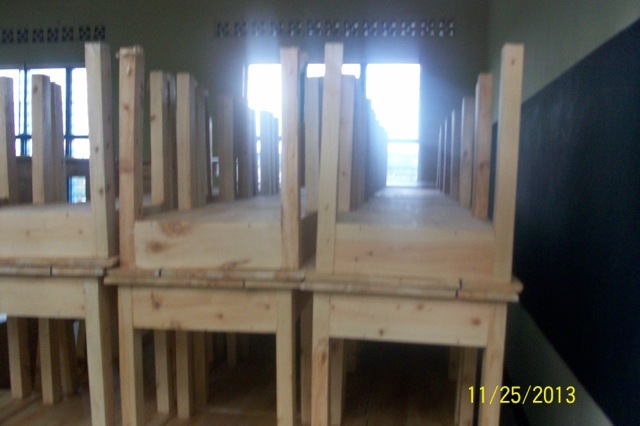 The work to have Primary 3 ready for the kids by January 6 was completed. A photo shoot through the new Glascow Center for the Arts. Starting at the main entrance. This is the performing arts and drama area. Our Dancers, Story Tellers, Artists and Musicians will use the area to display their talents and the work they have done to an admiring parents and classmates. Sitting area our audience. Benches are placed for seating. The area can also be used for small meetings or just for reading after having visited the library. The music instruments available for our kids. We would welcome used usable instruments you may have in the attic that your kids tried and put aside. We could use some small guitars. I didn’t know they made them but I am told they do. The big one is too big for our kids. We also would like donations so that we can purchase native instruments to preserve the culture of authentic African music. 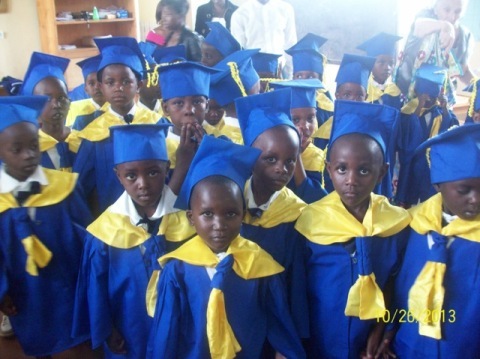 70 children graduated from Kindergaten at Urukundo Learning Center on October 25, 2014. What a glorious day it was. All students and parents preparing for the Parade. 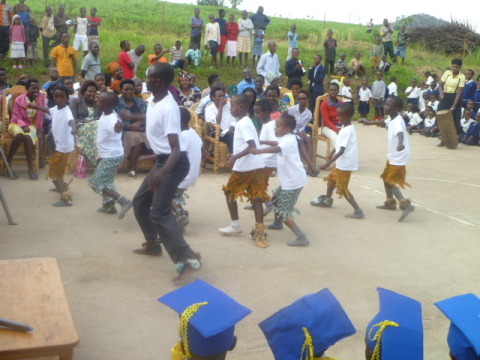 This scene takes place along the road for the neighbors to witness our graduates, students and parents. They made a very long line. The parade coming in at my gate. Our guest of honor was GASPARD RUTEGESHA from the board of education in the Cyeza Sector. He took part by shaking hands and giving each child a certificate. I felt very short today, my five foot one next to this six foot 7 gentleman. It's a good thing I was sitting down. He was our honored guest and main speaker. 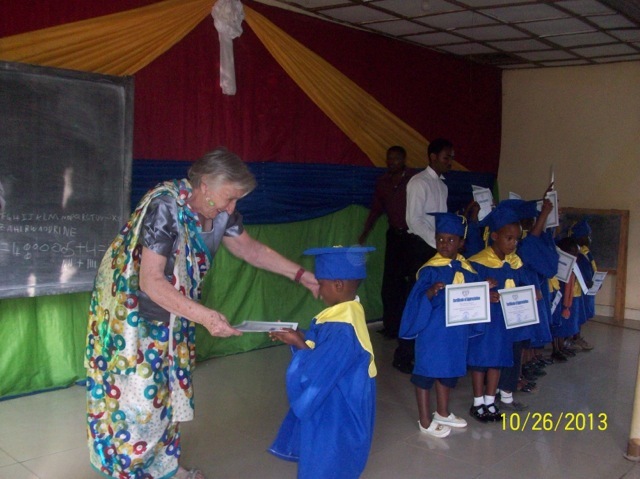 The president of Urukundo Foundation's Board of Directors Hildebrand Kanzira spoke, encouraging the children and their parents to place much value on education. Even I added my 2 cents' worth, using the back of a chair for support. A first at our graduation celebration: the music and art department presented a program for our entertainment. 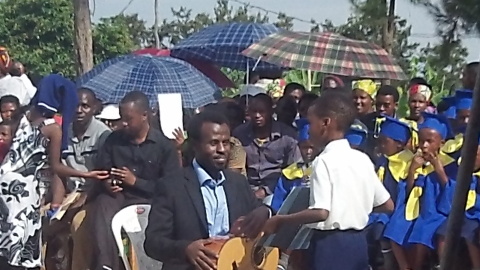 Bono the music teacher traveled from Kigali to be here for this occasion. 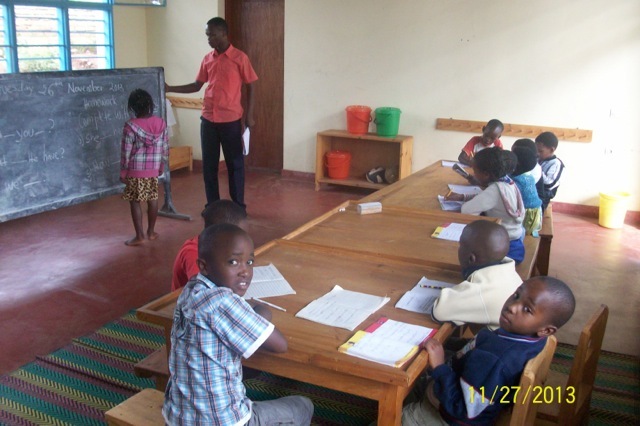 Bono is from the Kigali School of Music and teaches twice a week at Urukundo Learning Center. Intore translated means 'an all-boy dance team'. The boys did a great job. Keeping the culture alive for the children is so important. The girl dancers were not to be outdone and we were delighted. I have so many wonderful pictures it was hard to decide which would give you a clear picture of the event in the lives of the children and the program you are making possible by your gifts and donations. Last month desks were delivered, and in December our chairs arrived. Arranging the new classrooms and interviewing and hiring 3 new teachers are all part of preparing for the 2014 school year. A very busy time at the Center. School begins January 6 which is early this year. Summer classes in English. We are trying something new! Urukundo Learning Center offered English class for 2 hours Monday through Friday for children from our home, our school and the community. These kids are 6 - 7 year olds. 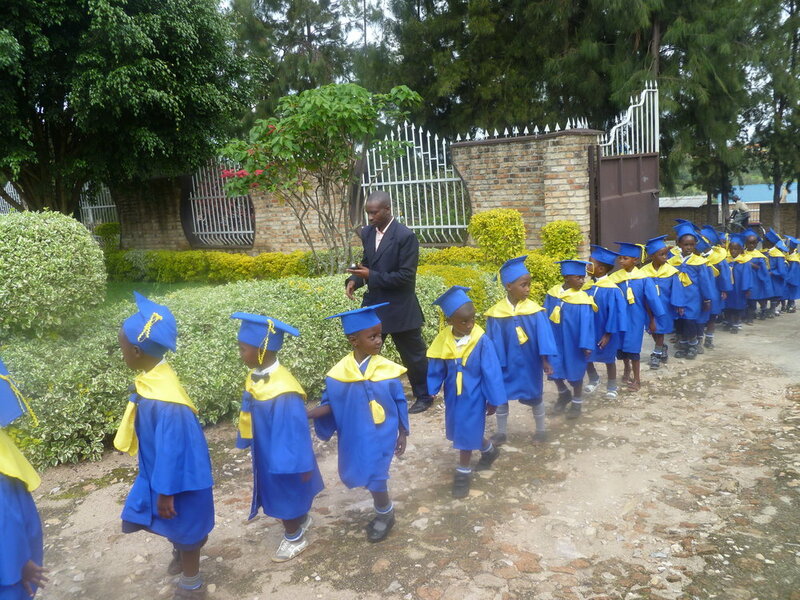 This holiday in Rwanda is a 3 month holiday much like the summer shutdown for schools in the US and other countries. 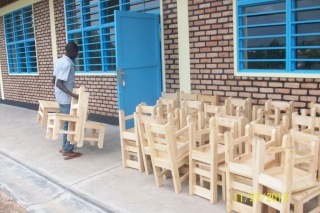 Furniture for Primary 2 class rooms. The desks have been delivered. Chairs to be delivered the end of November. Picture next month. Thirty-seven 6 year olds finished Kindergarten Saturday October 26. Gathering for the march to Hope House for the ceremony. Family & friends attend the ceremony. 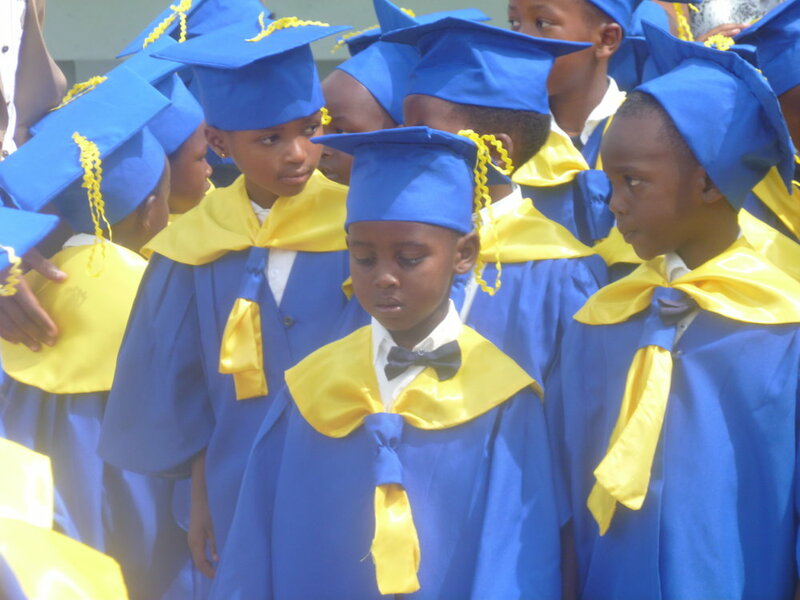 Next year Hope House will be too small for the ceremony as our children increase and more parents coming to honor their kids. We are negotiating with a builder for desks and chairs. The desks open. Each set costs 21,000 rwf. Don't panic. That is about $32 USD for a desk and a chair. 50 students will move to second grade. Pictured below is what you will be giving to the first class and future classes with your gift. The first coat of rust-proof paint on windows, doors and gutter is finished. Blue paint to follow. The window glass goes in next. Funding is needed. Appriciate your help. This is the site of our next building project, we hope. It will be a two story building saving land and will house grades 3 & 4. This land is for sale. We need it, and we need partners. A donation to Hope Made Real reduces your income tax as we are a 501(c)3 organization. Think about it. What better way to spend your hard earned money? 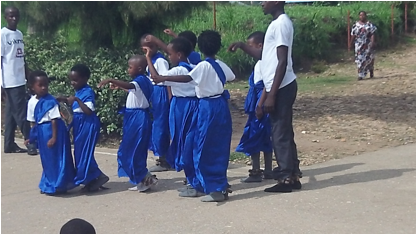 A typical day at school means lining up to sing the national anthem and other songs to show pride in their country and to praise all the blessings they have. Daily sorghum porridge is served for the preschoolers as studies show nutrition is important for focusing and learning. For some this may be the only meal until dinner. They learn hygiene by cleaning up before and after snacks. Listening skills are emphasized during storytime. Time for play is important to show education is fun. 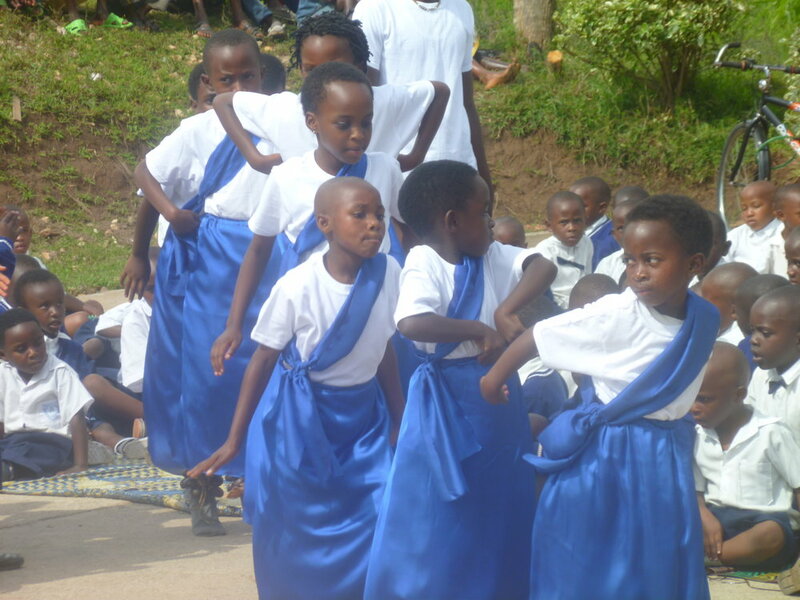 The curriculum also includes creative arts, writing, math, history, science, French, English, Kinyarwanda and time in the library. Opportunities for teaching in and outside the classroom abound!! !